A simple way to convert PC inputs; keyboard, mouse, joystick and more into midi input, combine with other midi instrument input, enhance, and then route to instruments, with quick re-configuration. Enables features that are normally considered “high-end” in keyboards, such as keyboard splitting (parts of a keyboard playing other instrumental sounds), and key and octave shifting at the touch of a key. Design Intent: to create an open, extensible system to integrate a pc/mac and midi devices into a single musical instrument usable by anyone, with a flexible “set-up once and forget" process. This is my gift to the midi music world. 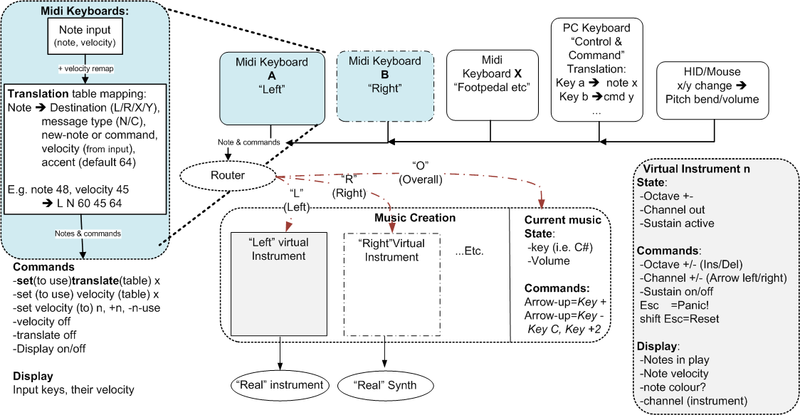 basically, one instructs ones' computer to take the input from various input devices: midi keyboards, foot-pedals, PC keyboard, mouse and more, enrich with special info and route it to the virtual instrument of ones choice. Why I created Midi Integrator. For each input device (PC keyboard, mouse, axis keyboards, etc), one just creates simple tables that specify what each desired input action gets mapped to. These tables are simple to edit – even using Notepad, and simple to understand. Preset-load: change the configuration of the instrument to a preset set of values, and tables. Fifth, a new expressive value called accent, for future use. Several versions of each table can exist, and changing the one currently loaded will reconfigure your instrument. It's not complicated, and I visualize that people will trade tables freely. This would allow us to make our instruments do exactly what each one wishes, and for the community to evolve an excellent bag of tricks for all to share. Setting up the PC keyboard to play bass accompaniment. Here is a short overview of how Max/MSP works.